Growing up, kids always have dreams of what they want to become. A fire fighter, a police man, an astronaut; we all aspire to be something more. For me, it was a professional hockey goalie. In my mind, they’re the last line of defense who get all of the flak when a goal is let in but also all of the glory when that huge save is made. And while that dream of mine never came true, even as an adult, I still maintain that underlying principle: to be someone greater than who I am right now. 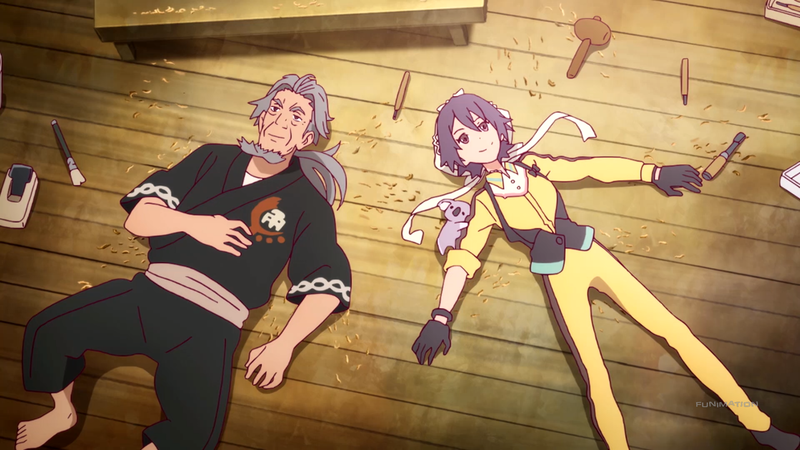 For while you or I may be content with our current selves, as they say, “there is always room for improvement.” Rolling☆Girls uses this idea as its base, but the pretty visuals and varying soundtrack cannot make up for the plentiful errors elsewhere. Rolling Girls stars Nozomi Moritomo, an avid fan of the legendary “Maccha Green.” When Maccha Green is injured during a duel, Nozomi, along with her newfound buddies Ai Hibiki, Yukina Kosaka, and Chiaya Misono, traverses the countryside to complete the contracts her idol had yet to get to. All the while having the adventure of a lifetime. The best way to view this show is on a micro and macro scale. That is, there are the individual, slice-of-life instances and the overarching narrative that ties it all together. Essentially, starting in the small camp, the girls move from location to location participating in hijinks while providing some interesting backstory to the world presented. Interesting is kind of the wrong word though; rather, it’s wacky. Not so much random as it is “culturally diverse.” In short, each area maintains its own, distinct motif. From the anime-obsessed city to the village that thrives on motorbikes and fish statues, there’s never a dull moment when it comes to the sights to be seen. However, this already introduces an unsightly problem: disjointedness. The only commonality that really exists between these separate instances are the girls. There is no correlation from one set of events to the next, meaning when one problem is solved or taken care of it is subsequently dropped and forgotten. This missing sense of connectedness always made the show feel as if what it did was never worthwhile, because nothing ever came of it. One way to fix such an issue is for the macro level to incorporate some form of togetherness. Here, Chiaya’s alien subplot is brought forth. But once again, the problem lies in how meaningful it all comes off as being. Initially, Chiaya’s background was shrouded in mystery, which later gave way to peculiarity. People were looking for her, sure, but her status or predicament never directly affected the micro instances, with the exception of the concluding one. At this point, the anime goes through an exposition dump, releasing all of the necessary details to make the previously rocky plot have some form of substance. But it’s “too little, too late.” Since the compact happenings never seemed to make the girls grow and the larger happenings never managed to maintain a sense of purpose besides at the ending, it all comes off as having a lost sense of direction. It’s like the girls were simple tourists, enjoying the various landmarks “just because,” without ever having a fulfilling experience despite everything they witnessed and went through. 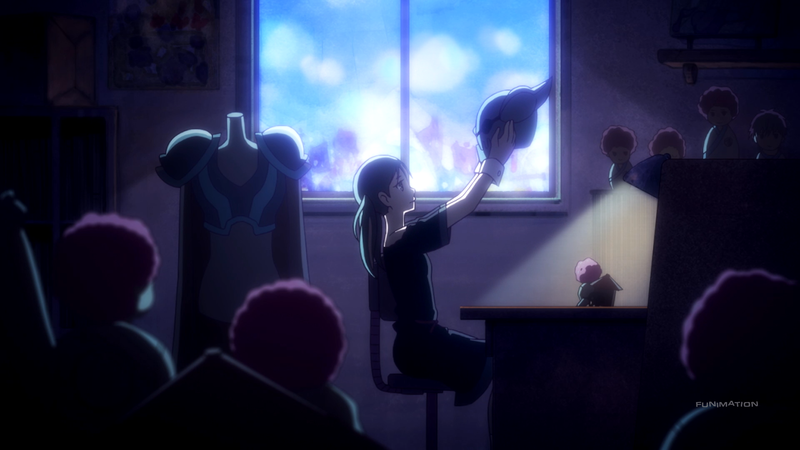 The anime does have a thematic presence, even if it is small, and it’s the one talked about in the introduction. The show places people into two groups: the “Bests” and the “Rests.” The former are those that wield inhuman power, supposedly due to the “moonlight stones” they found; the latter is everyone who isn’t a Best. Naturally, the girls are all Rests themselves, which is what makes their subcontracting strange. Basically, since they have no powers of their own with which to use to solve the problems at hand, they go by normal, conventional methods instead. What’s interesting, though, is that it’s these very same Bests that have all of the issues; that is, despite their newfound status and capabilities, they still have problems of their own. So what we see is that the stones don’t make the person: it’s the person’s passion that provides them with the wherewithal to do the impossible. In other words, everyone, deep down, is a Best; he or she simply needs to unlock his or her own potential to become one. This message – that with enough tenacity, dedication, and determination, anything is possible – is promising, because it’s something we all understand. Unfortunately, the show forces this idea rather hastily at the end, with little in the way of exploration of it besides an example and a few lines from a narrator. Meaning, while the theme on its own is strong, the show’s inability to properly work with said theme prevents it from becoming lasting or meaningful. The strongest aspect of Rolling Girls is the art and animation that accompanies it. Once again, strong might be the wrong word; it’s often captivating in what it creates. The most obvious detail is the coloring, with the vibrancy and vividness apparent at all times. 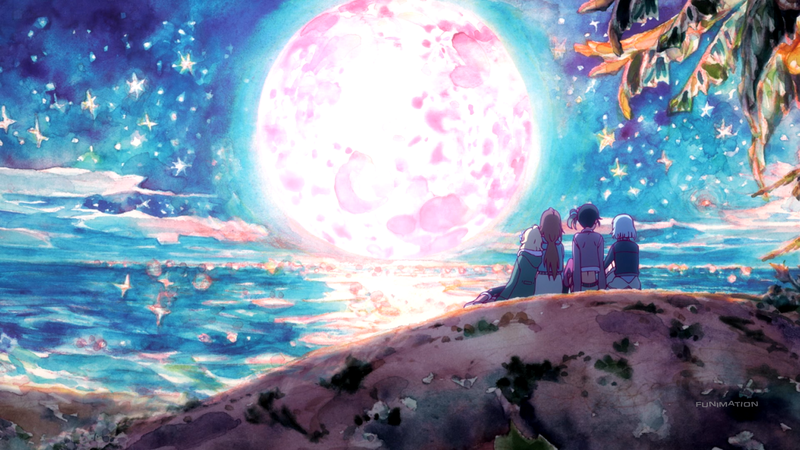 There are more colors used for everything within the anime than there are stars in the night sky, making each place pop and crackle with shades and tones that seem almost unreal. 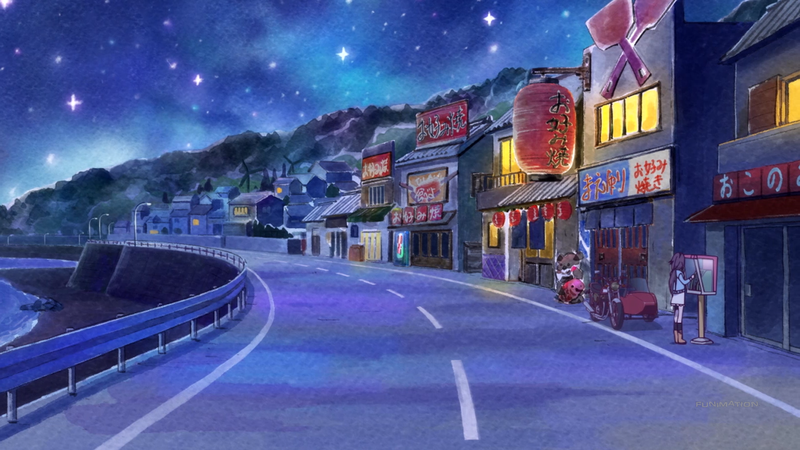 But to make it have that much more of an impact, the backgrounds are water-colored, giving each environment a rough yet serene look about it. Each place is beautifully handled, and due to the sheer amount of diversity encountered, the show is given ample opportunities to craft whatever it sees fit for the moment. The character designs follow suit. As with nearly all things Rolling Girls, due to the characters being a part of their own settings, everyone manages to have their own signature look. Nozomi has her motorcycle gear, Ai sports her half bikini, half leather jacket outfit, and Yukkipe wears her all-blue fashion with matching trucker hat. And even the side characters – from the young geisha, to the bar-owning butler, and even to the one teenager with the crocodile mask – each have their own designs that bring about their own flair. Actual animation is also above average for nearly the entire show. There’s a lot that goes on – circuit races, concerts with fireworks, and aerial warfare with giant robots, to name a few examples. But the most stellar scenarios to see are the Bests doing, well, “what they do best.” They literally explode with colors, flowers, and energy that clearly demonstrate not just their powers but also the great attention to detail each punch, jump, or sword swing held. When it comes to Rolling Girls, a large portion of the cast cannot stand on their own. Main member Nozomi is arguably one of the most underwhelming characters in a starring role, doing next to nothing throughout the entire series. Yukkipe is similar, with her only trait being her bad-yet-not-bad drawings and horrible sense of direction that gets overused joke-wise. The side characters also land into the same bad habits; they’re given minor, relevant background information to make their cases garner some sense of importance. But as has already been discussed, these same characters are around for an episode or two, making such developments in their persons seem weak or inconsequential in the grand scheme of things. Now, one argument for why the sides get more focus, and therefore more development, when compared to their main counterparts could be for the simple reason that they are Bests while the girls are “lame” Rests. Yet, this goes against the established theme; if we’re all capable of being something better, why not place attention on those who can become so? It’s almost counterintuitive, since even when we know this to be the message, we never truly see it come to fruition through the characters and their actions. Regardless and moving along, Chiaya doesn’t fare much better. Having been cooped up in her home to keep her out of harm’s way, she never had the chance to experience school, parties, and most of all, friends. So, this journey of theirs did just that. The girls have their own highs and lows between each other, but eventually, Chiaya and the rest become the best of friends, giving her the one wish she sought her entire life. Her characterization is nothing more than a cute little girl who randomly transforms into her true, alien form from time to time. And sadly, even the outcome reached doesn’t feel like it was achieved. 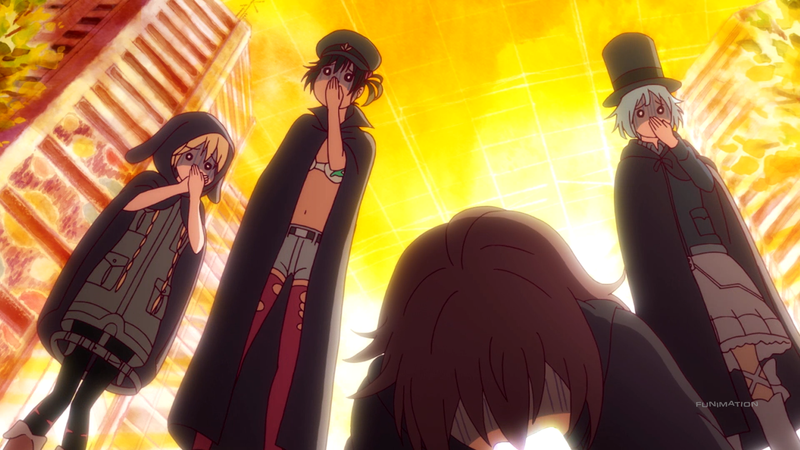 The anime (understandably) spends a lot of its time on the constant stream of new side characters and when it does shift its focus to the group, they never come off as a tight-knit band of buddies, mostly because they hardly do anything – not just for each other but together. The only character worth mentioning is Ai, but this isn’t saying too much. Her whole reason for joining the gang from the beginning was to simply become a “Best.” That’s it. But out of everyone involved, she seems to have the only personality that differentiates her from the others. Not only does she come off as somewhat selfish but also she never gives in to the tribulations set before her. She tries and fails on numerous occasions, but her hard works pays off, allowing her to “level up,” giving the characters and the audience the insight about the theme of dedication. She more or less grows as a person, both in her behavior and in strength. It’s minimal, though; to reiterate for the umpteenth time, such monumental changes happen right near the finale in one fell swoop rather than being nurtured over the course of the anime. Thus, instead of Ai’s character being impactful, she ends up being only slightly less useless than all of the other cast members. If this anime is remembered for anything sometime in the future, it most certainly will be for its opening theme. It’s a fantastic piece that perfectly captures the fun that is had, the rocking music that it jams to, and the ideas at play. Its extremely catchy beat and simple lyrics really do make you want to “go for it.” As expected, the ending theme is a big step down. It utilizes the same rock-n-roll instrumental vibe, but doesn’t have the same adrenaline-pumping feeling. The tameness and slowness makes it a piece that contrasts in a bad way with the OP, and in turn the goings-on of the anime itself. The original soundtrack is filled to the brim with a large amount of tracks that keep the style of the anime in mind. Tracks such as “Macchagurin Basasu Shikkou” have a mixed style of piano and hard guitar to highlight the uniqueness of the world, whereas “Mame Sen Dai” demonstrates the cultural influence many of the locations steep themselves in. Even something like “Onore…” keeps with the rocker sounds while still acting as a foreboding mood piece. And beyond this, each area has its own lyrical track that usually plays at the climax of each of the smaller plot lines. This not only further makes each setting its own, distinct environment but also boosts the OST’s overall strength. 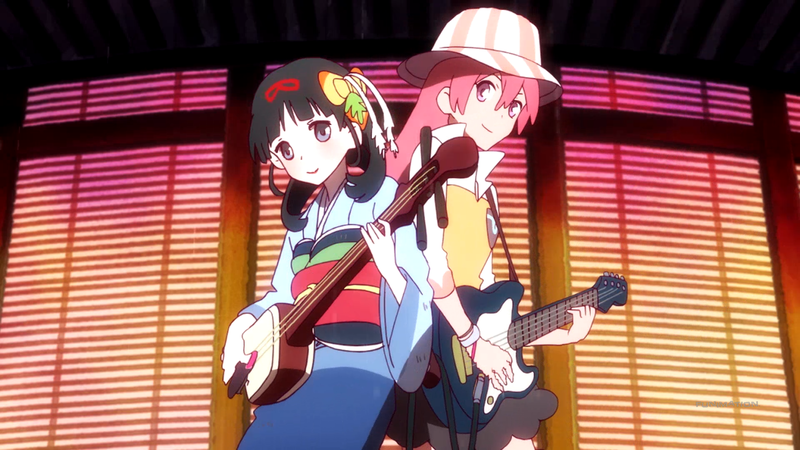 Since Rolling Girls so heavily leans on the idea of togetherness, including such band-like performances only makes sense in this context. The voice acting for the show is somewhere around average. Special shout-outs are deserved for Ari Ozawa as Nozomi for her not-too-girly voice and Risa Taneda as Ai for her tomboyish manner of speaking. When I first saw this one, and even when it first started airing, I was pretty convinced that it was going to be something good. Not “greatest I’ve ever seen” material, but at least something that could be remembered when it finally wrapped up whatever it had set out to do. All of the pieces were there to work with – an interesting world, some fun characters, and cool visuals and music to boot. But like a Lamborghini without gasoline, it looked pretty but didn’t go anywhere. The longer it went on, the more it all started to blend together. It reached a point of repetition, with the same relationship-mending occurring at each stop along the way. And those “fun” characters started to lose their sparkle once it became noticeable that they didn’t do much of anything. It all became rather boring since Nozomi, Chiaya, and the others were such paltry characters. I couldn’t come to care for them, let alone find myself investing emotion into the anime’s progression. The laughs dwindled. The only real drama surfaced too late. And the actual ending was less than ideal. It was a heaping pile of potential that was squandered by the show’s own devices. Rolling☆Girls could “talk the talk,” and while it did manage to “walk the walk” for a brief period, it slowly came to a crawl and eventually a full stop. The art and animation is top-notch, and the sound-work is handled nicely, but it doesn’t make up for the lackluster story and especially the incredibly weak cast that it contains. Or in the anime’s terms, it’s not one of the Best; it’s just like the Rest.